Easter Day: God Knows its Real! I like that turn of phrase; "God knows its real! We use it to describe something so deep, so profound, that the thruth of what we say is self evident not just to those around us, but deep within our own personhood.We use the expression to affirm and to comfort one another in the whole range of human experience. On this Easter Day we read of Mary's tears! God knows they were real. Jesus had been crucified. God knows that was real. Then they put him in the tomb. And now early on the third day, the women went to the tomb to do the ritual preparations for burial. So far, so good. All far too real, God knows. Then the stone was rolled away. The body taken. "Where have they taken him?" She asked the gardener, the indignity of grave robbers added to the grief. She didn't recognize him right away. Who can recognize Jesus right away? Jesus is right here in our midst and in the lives of those we meet along the way. But we are slow to see what is right in front of us and slow to understand. Reports began to arrive. He has been taken away! Then there was a good deal of panicky running around. This whole passage has the sound of reality to it. Then finally, there was the sudden dawning of the existential moment. Oh my God! The Resurrection; just like he told us it would be! The Easter Proclamation. It was an existential recognition. Jesus Christ is Risen today! Alleluia!. It is an existential statement out of the depths of our human experience. The compression of the whole range of human emotion in Holy Week plumbs the depths of the universe of human sensibility. God knows there's suffering. The memory of the Boston Marathon bombings is still with us four years on. God knows that's real. And yet, the Richards family will dedicate a new park at the Children's Museum in honor of their son Martin who was killed in that attack. The resilient hope of humankind and the children of faith take the place of loss. Underneath all of our loss and sorrow there are still as ever, the Everlasting Arms. The recent cruelty of gas attacks on innocent children in Syria. The suffering and death we share. The angst we know about in the plight of those children who die in warfare and who become refugees and then are not wanted because they have no home of their own in their own land or any other for that matter. God help us! God knows this is all too real. God knows the suffering of Jesus on the Cross is real. But what of his resurrection? What of this day. Can we give as much credence to the existential cry of the first Christians who said; "He is Risen!"? God knows; sometimes yes, sometimes no. For Mary her tears gave way to her next cry; "Christ is Risen; the Lord is risen indeed!" This is an existential cry we share with her in the hope that our faith and her faith are one. Mind you her faith was born out of the very real doubt that she could believe her own eyes. Neither could the disciples believe it until they saw it with their own eyes. After all, in a male dominant society who could trust the ravings of a hysterical woman? Surely, she is seeing things! 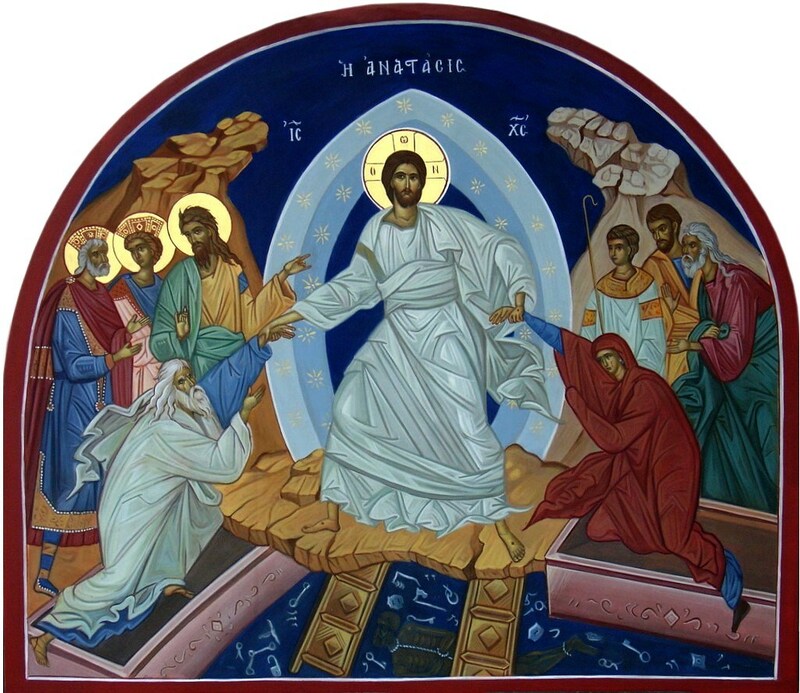 This whole business of death and resurrection; tries our senses and defies our common sense. God knows that's true. And yet at the death of a loved one what do we say; "O they're in a better place now. They're in God's hands now. We Celts sometimes say; they're on the other side. God knows there are many ways for us to say it; we hope against hope. Down through the ages we have been known as The Easter People, because of the existential way we greet this day, this Season, and life itself. 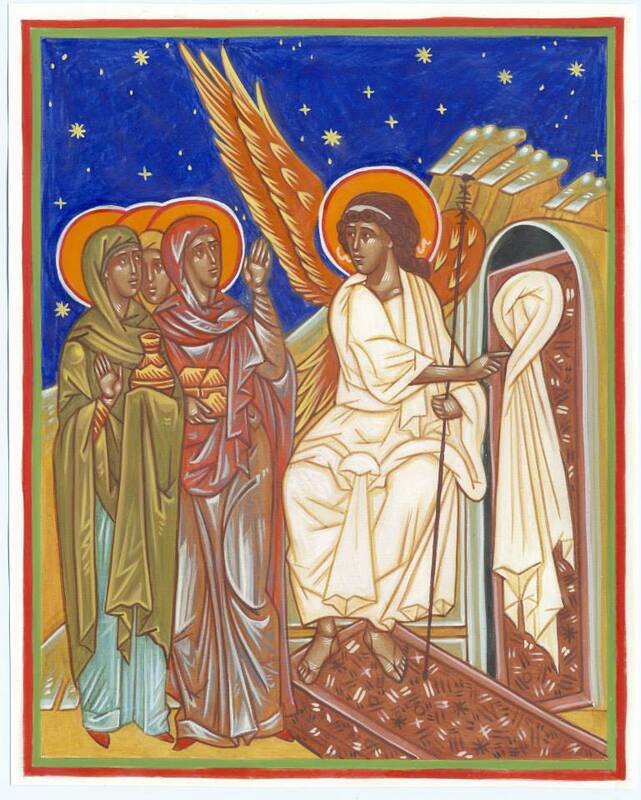 The first words with which we greet one another on this day are those first existential words: "Alleluia Christ is Risen. The Lord is Risen indeed! Alleluia!" These are the first words in every language with which Christians greet one another the whole wide world around. In the face of the human doubt and despair we cry the tears of Mary's sorrow, the exclamation of her unbelieving eyes, and then the Gospel cry of Mary's joy. God knows this is all real! Since that day we Christians face down every assault of the Absurd with the Power of Christ's Resurrection. Whether it is the death of a loved one or the wholesale dread of war, The Paschal Mystery is not our way to die but our way to live. In the face of human violence, we proclaim the Way of Jesus Resurrection. You see, eternal life doen't begin with our death, it begins with our Baptism. When we die with Christ, we are raised with him. We die a death like his in order that we may live a life like his. That life is characterized by a recognition like Peter's. "Aha, now "I truly understand that God shows no partiality". 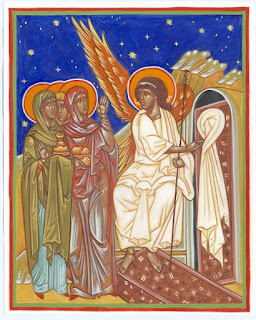 As blessed Paul was to state the new understanding, when you are in Christ the is no longer Jew or Greek (nor any other racial or ethnic identity), there is no longer slave or free (nor is there any other class identity based on wealth or poverty) there is no male or female (Good Lord, neither is there any other identity based on orientation, for heaven sake). This is because we are all one when we are Baptized into the Person of Jesus Christ our Lord, and him Risen from the Dead. And friends here we greet one another this Happy Easter Day all of us Risen with him in a life like his because of this very Baptism we all share. To be sure there will continue to be dreary and dreadful days ahead, but they needn't overwhelm us. The darker the days are the more work we have to do. I once served as Chaplain of the Police and Fire Departments in Methuen, MA. At a special banquet to honor the heroic work of the men and women in Blue the Chief leaned over to me and said; "You know Father, we better not do too good a job, because then both of us will be out of work!" "Not to fear my friend," I replied. "There is no end in sight nor is there any known cure for Sin." In fact, as our professor of Theology used to quip in Seminary; "Sin is the only doctrine in the Christian Faith we can prove". All you have to do is pick up the morning paper or watch the news. And there it is; the sad chronicle of human sin. All other Doctine you must take on Faith. This Day of Days; this Queen of Christian Festivals we now proclaim the Victory of Jesus over the wickedness of Sin. Now are we forgiven. Now are we Raised from the Dead. 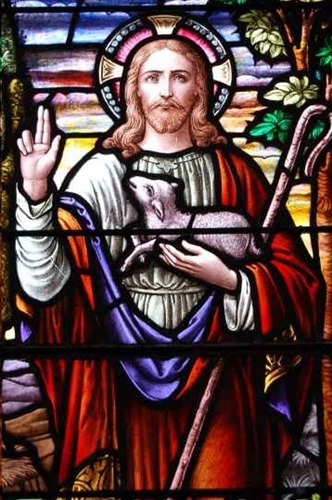 On this Good Shepherd Sunday, I must remember those who were the Good Shepherds of my life. Having just returned from Toronto, I found myself visiting a flood of memories stretching back more than half a century. By the way, the reason I ended up in Toronto in 1956 was that my mom remarried after the death of my dad who died in 1953. The man she married, Homer Kershner, "HK" I called him, was hired by the Toronto based Weston Biscuit Company, Canada’s version of Nabisco. He was the chief engineer of the company and it fell to him to purchase and install band ovens and packaging machinery for the many products that Weston’s distributed throughout Canada. He and my mother were among the many "Good Shepherds" of my life. So there I was in Canada at the age of 11, a child of Blue Collar Somerville, suddenly translated into a somewhat foreign land to me and more jarringly into a solid upper middle class culture. It was not always an easy adjustment. But there was one thing that I did right. When the parish priest stopped by our home to announce that a new church was being organized in the neighborhood, I immediately began to attend. My family was not the least bit interested in church, faith or religion, but I had then and still do have an incurable case of the love of God and the love of God’s people. That parish priest, Fr. Fred Hall became a Good Shepherd to me. In fact his whole family took me under their wing. Particularly as I entered my college years and I grew more and more into my young adult years and independence. Out of their generosity and love, they always held a place for me at their Sunday dinner table. Fr Fred and I loved to talk philosophy and theology. Having recently graduated from seminary, his confirmation classes were very demanding. We had to write examinations in the church’s catechism and demonstrate a mastery of the material that is the very underpinning of the church’s teachings and thinking on a whole range of church doctrine. Being an independent and critical thinker, I loved to challenge my priest and he loved being challenged. Our confirmation classes were exciting and intellectually stimulating. But what I remember most vividly was the love he bore for us. During our high school years he required that we attend mid week Lenten services at 7am. After Communion we would go to the parish hall as he prepared a full breakfast for us, and I remember his delighting in the work he did, his smiles, his laughter and most of all, I remember his love. He was, in short, my Good Shepherd; he was indeed our Good Shepherd. We became Good Shepherds to one another. We formed a youth group that numbered, at its peak about 30 teens. He sent several of us to the Diocesan Conference Center for leadership training. We constituted ourselves as a local parish based chapter of what was then known as the AYPA, the Anglican Young People’s Association. We were a very active chapter. In fact the Diocese used to hold youth events for us as Dioceses still do. Our own Diocese has a youth council, there are many youth events held at the Barbara Harris Camp and Conference Center and the National Church holds an annual gathering called the EYE; the Episcopal Youth Event. These experiences away from home, learning how to become more increasingly independent and informed about our church and the world in which we live, continue to be life changing events. As your children and youth grow I encourage you explore these resources as I did in my formative years. So there I was in Toronto for my 50th College Reunion. I met with old friends there. I met with Fr Fred’s family. He’s gone on now but we remembered those special days and then we caught up with each other. The intervening years have come and gone, and there was much catching up to do. There you are folks; the Good Shepherd as seen from a grown man who did the job in the fields of the Old Country. Obviously we have to know them all by name. The collect of the day and the Gospel both tell us that “when we hear his voice we know him who calls us each by name”. We trust that voice because we know who he is. And because we trust him we follow in the way he leads. There were many “barking dogs” in my life keeping us all together. I’m not sure that my parish priest would appreciate it if he knew I was comparing him to a barking dog. But think of it. Who are they who keep us altogether? Certainly there are family, friends, teachers, clergy, folks who have taken the time to have a critical impact on our lives. They’ve spent the time to care. Moreover, they were always there! And then of course there were those times when we got way out of line. Somebody had to whack us upside the head to wake us us up as we blindly, blithely headed toward one catastrophe or another. To know each other’s names; to care enough to be there for one another and to love each other enough to tell the truth to one another in love is to be a Good Shepherd to one another. What then does it take for us to build one another up in love and to be Good Shepherds now at Trinity Church in Canton? "Those who had been baptized devoted themselves to the apostles' teaching and fellowship, to the breaking of bread and the prayers. Awe came upon everyone, because many wonders and signs were being done by the apostles. All who believed were together and had all things in common; they would sell their possessions and goods and distribute the proceeds to all, as any had need. Day by day, as they spent much time together in the temple, they broke bread at home and ate their food with glad and generous hearts, praising God and having the goodwill of all the people. And day by day the Lord added to their number those who were being saved." Yes, and day by day, God added to their number those who were being saved. As Good Shepherds that’s exactly what you and I are being called to do. That word “saved” can be mangled by modernism. But it is is a matter of sober reality that the messes we make of our lives, and the messes our loved ones make can be very real and catastrophic in nature. You name it we do it. Drugs, divorce, dysfunction, depression and on and on an on. Violence, racism, bigotry…the list is endless. But there must be one place in this world we live in where we can seek refuge from the misery of this sin sick weariness which so often strikes the human condition. That’s where the church comes in. That’s where you come in. You and I are God’s Good Shepherds. We know one another by name. We keep one another together as sheepdogs would. We speak the truth to one another in love, keeping one another watchful and wakeful of God’s awesome wonders all around us. And by being the healing and reconciling presence of the Good Shepherd we are being called to add many to God’s household of love day by day! There you are folks; God's marching orders for this Good Shepherd Sunday! May God so guide us in the living of these days in such ways as God directs us to live.